See the colleges that offer the best overall Computer Information Systems major. 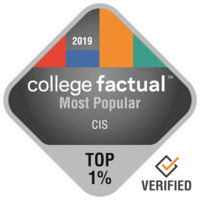 Find the colleges that offer the best value for your money for undergraduate degree programs in Computer Information Systems. Discover which colleges graduate Computer Information Systems students who go on to earn top starting and mid-career salaries. Check out which colleges graduate the highest number of Computer Information Systems students. Computer Information Systems students make up the largest percent of the student body at these colleges, which could indicate a strong educational focus. This ranking identifies online programs in Computer Information Systems with the most number of graduates. This ranking highlights schools offering courses in Computer Information Systems that can be taken online. The ranking is based on education quality, graduation and retention rates, program accreditation, and more. Here you can find the full rankings of the best schools for veterans pursuing Computer Information Systems degrees. Here you can find the full rankings of the best schools for non-traditional students pursuing Computer Information Systems degrees.